They come from the trees. When the city encroaches on the forest, nature finds a way to reclaim what is rightfully hers. 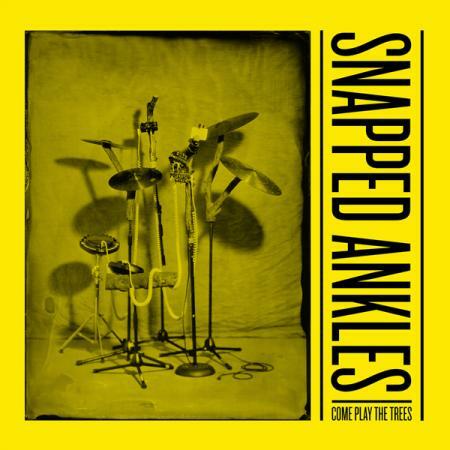 Snapped Ankles arrive as messengers. On their debut album Come Play The Trees, they hold up a mirror to us. They’re here to plant the seed. They’re here to have a good time, but never at the expense of the natural habitat. This band emerges from the woods clutching an album that feels simultaneously modern and ancient. This is dance music once the computers finally fail us. Log synths, bass guitar and sticks on taut animal-skin form fearsome primal rhythms. Fuzz guitars rub up against dirty, rolling, arpeggiated synthesisers to ignite wild white-noise fires. Forest folklore passed down through generations has made its way onto these tracks. Subjects veer from dystopian futures to Swedish flat-pack furniture, from the films of Jean-Luc Godard and Andrei Tarkovsky to throwaway YouTube comments. High art and cultural detritus are all fair game—a brave new world indeed.